Camping is great. But why is the cost of camping so high? Camping really does give you the opportunity to get the most out of your outdoor experience. There’s nothing better than waking up, unzipping your tent, breathing in the air and feeling that quiet contentment you only get when you are relaxed in the outdoors.. It also used to be very cheap, giving everyone the opportunity to experience the benefits of the outdoors, whatever their budgets or background. The popularity of camping is certainly growing. As life gets more complex, busy and stressful it seems more and more people want a simple, uncomplicated experience which takes them away from the fast paced material world. That’s wonderful. But it seems the material fast-paced world they want to escape from is exploiting this. Camping is not cheap. We were recently quoted £50 for one night’s camping in a New Forest site (for a family of four with one small tent). We declined to go as we thought this was too much. 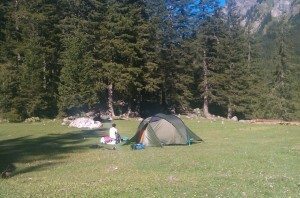 Campsite owners obviously need to make a profit, but those kind of prices are not exceptional. There was once a time when most campsite were farmers’ spare field. You would have to knock on the farmhouse doors and wait for the Wellington- booted farmer to emerge. They would ask for a couple of quid and then point you to a field in the distance. Alternatively, there was simply a sign to the site inviting you to pitch. You would then be woken early in the morning by the farmer asking for payment. Basic loos and a standpipe were usually offered. Hot water was at a premium. Not any more. You now mainly book via the net (which admittedly is very convenient for all parties). For one site we visited (also in the New Forest) we booked through a call centre. Other sites stress their ‘terms and conditions’, proving that camping is now a commercial product just like anything else. At a time when travel and accommodation is getting cheaper, camping seems to be becoming an exclusive experience. We know of families who have decided against camping because of the cost. Although comfort and a goods nights’ sleep are still as elusive as ever for any camper, the privilege of sleeping in a tent now comes at a premium. This doesn’t seem right to us. It’s really wonderful that camping is so popular, but its draw and popularity to us, is its simplicity. This priceless experience, is now becoming a marketing commodity with a big price tag to match.